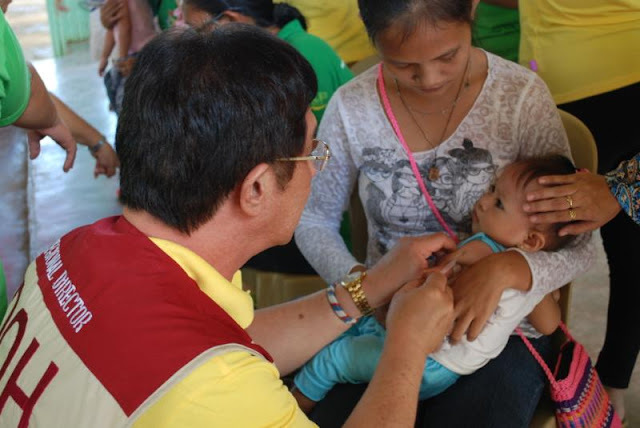 DOH CALABARZON Regional Director Eduardo C. Janairo leads the administration of measles vaccine to children during a regional mass immunization campaign against measles in one of his visits in the province (file photo). DOH-CALABARZON (Cavite, Laguna, Batangas, Rizal, Quezon) yesterday sent advisories to all Provincial Health Offices (PHOs), City Health Offices (CHOs), National Immunization Program (NIP) Coordinators and Provincial Health Team Officers (PHTOs) to immediately conduct mass immunization against measles including oral polio vaccine (OPv) to all children, prioritizing aged 6-59 months old. “Due to the continuously increasing number of measles-rubella cases we must immediately provide immunization to all children regardless of their vaccination status, whether they have received the vaccine or not, everyone must be immunized,” Regional Director Eduardo C. Janairo strongly stated. “We will include children ages 5 years old and above to ensure that everyone will be protected and further prevent the spread of measles to the population,” he added. According to the Regional Epidemiology and Surveillance Unit (RESU) from January 1, 2019 to February 2, 2019, there were 560 Measles-Rubella cases recorded with 14 confirmed deaths, Age of cases range from 9 months to 81 years old. This year’s figure is 409% higher compared to the same period last year with only 110 reported cases and one death. Janairo explained that the massive mass immunization activity will include house-to-house visits, reading of message advisory during church services, distribution of IEC materials on measles vaccination and setting up of injection posts in churches, bus stations, food chains, schools and other public areas. Measles appear around 7 to 14 days after exposure to a person infected with the virus. Among its signs and symptoms includes fever, dry cough, runny nose, red watery eyes (conjunctivitis), tiny white spots (Koplik) appear inside the mouth and skin rashes. “There is no cure for measles but it can be prevented through proper immunization of children aged 6 months to 59 months old. A person can receive the vaccine more than twice after 28 days or after a month after receiving it,” Janairo explained. “I appeal to all parents to have their children vaccinated against measles. It is their only protection against the virus and it is clinically safe and proven effective for many years,” he urged. In CALABARZON, the province with the highest number of measles cases is Rizal with 226; Laguna recorded a total of 115 cases; Batangas with 114 cases; Cavite has 87 reported cases; and Quezon with 18 cases.